If you visit a gunsmith during the early part of Red Dead Redemption 2, you'll be forgiven for taking one look at the prices in the catalogue and wondering how you'll ever afford to stock up on decent weapons. However, there is a way for you to get one for free, which can really help you out while Dutch expects you to drop all of your disposable funds into the camp kitty. If you want to keep things frugal and save your limited dollars during the opening hours of the game, then here's how to get a free gun in Red Dead Redemption 2. Once you’ve completed the introduction and hit chapter 2, you’ll be let loose in the open world and pretty much left to your own devices. From here you can continue to pick up missions for your camp and the surrounding area, go hunting, do some chores, or pick a direction and ride off into the wilderness. However, what you’ll want to do is first make sure you have a health cure on you then, ride just out of camp to the road south of Caliban’s seat. Here, just by the river, you’ll find a stranger who’s been bitten by a snake (if you can’t find him right way listen out for the screams). Interact with him and give him the health cure to stop the poison killing him. Remember the game won’t wait for you so he will die if you don’t help him. After being cured he’ll walk off and carry on with his business seemly giving you nothing, expect some honor points. However, allow a day or so to pass, enough time for him to get home, and head to Valentine. Here, sitting outside the gunsmith you’ll find you guy you helped earlier. He has a tab at the store and will allow you to choose a free weapon from the catalogue. Just head inside and choose what you want. Some of the weapons are locked to story progression but you should be able to get a nice new Rifle or Pistol which you can then customise anyway you like. There are loads of these types of Chance Encounters in the game. Some will just be grateful of the help, others will give you a reward on the spot and some, like this guy will reward you later but at another locations. Basically it’s worth helping everyone you can in case they have something good… or just shoot them. That decision is entirely up to you. Want to know what other guns you should get? 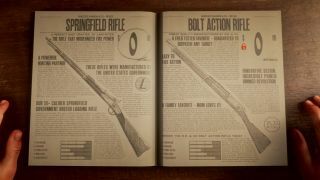 Then check out our best Red Dead Redemption 2 weapons guide.